Good food? Check. Great views? Check. Affordable? Check. Vietnam has a great mix of all of these things to ensure a unique travel experience for tourist and expert travelers. Having visited Vietnam previously during TET, also known as Lunar New Year, when many venues and events were closed I had an idea of what to expect. However, I was pleasantly surprised with the new encounters and corners of Vietnam's capital city of Hanoi the second time around. The bustling city of Hanoi certainly keeps you on your toes. Attempting to cross the street no matter the time of day is a challenge in and of itself; especially since there's a shop or store on every street that's guaranteed to catch your attention and garner further exploration. Street lights and signs are adhered too, but any sign of slight or hesitation leads motorists to accelerate instead of slowing down. So be sure to put some spring in your step and get moving across those streets. An interesting thing that we learned about the streets of Hanoi is that each of them are marked and labeled for the type of items you can find along the streets. If you're looking for aluminum and metal, there's a street marked for it. Trying to find shoes, there's an entire street dedicated for that as well. There are sprinkles of diverse streets scattered around the city as well, but most locals stick to the street signs which guide them to exactly what they are looking for. Can't be mad at that efficiency. The people of Vietnam are as easy going as they are efficient. When they're not driving and weaving through traffic, the overall daily culture is one of ease and sustainability. Life comes at you fast, but they are keen to take things one day at a time, one moment at a time. Unlike countries we've visited such as China, Japan, and Korea; the people aren't in as much of a hurry or rushing when walking along the streets, taking public transportation, or otherwise. Definitely made getting around, meeting people, and exploring in general much more laid back and accommodating. I was honestly very impressed with the food. First, Pho is amazing. Have eaten it several times outside of Vietnam in Taiwan and it was delicious. But Pho in Vietnam at every restaurant whether a small mom and pop place, mid-range with booths, or the fanciest of the fancy with lap napkins, is absolutely delicious. If you haven't had Pho, get out and try it today. In addition to Pho, the vegetables were fresh, the curry was lean, green, and delicious; the fruit shakes, fruit juice, and fruit mixed drinks were on par as well. If you're not up for an adventure in the city, come for the food, you most certainly will not be disappointed. 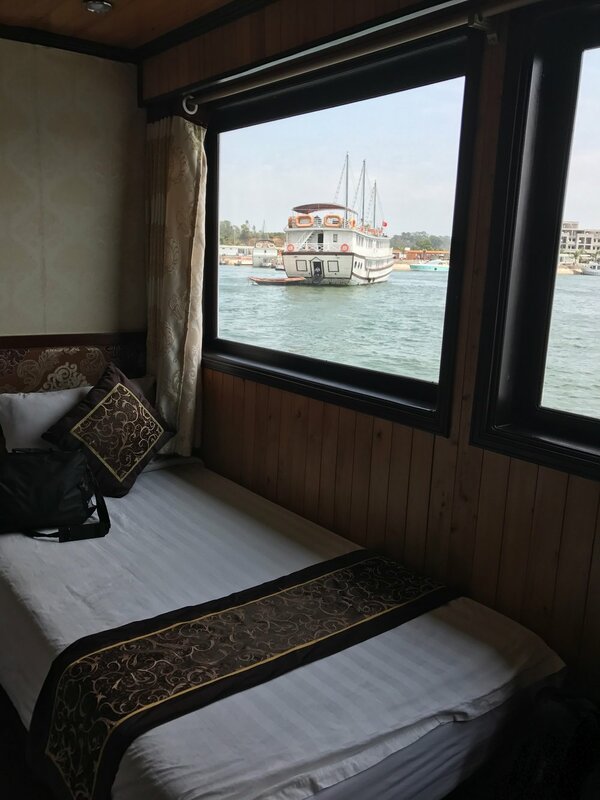 We ventured outside of the city to Ha Long Bay, Vietnam, for an overnight stay on a boat in the Bay while taking in the amazing sights of raised mountains, illustrious caves, and small beaches scattered throughout this world heritage site. Being a novice swimmer at best, and a top five germophobe (top 5 top 5) I felt a bit uneasy about this adventure. The adventurer in me propelled me to do so none the less. Upon first entering the boat I was certainly impressed. There was a full and spacious dining area, an above ground deck with lawn chairs and the full works, and a fully stocked bar which offered happy hour specials that we coincidentally arrived just in time for. 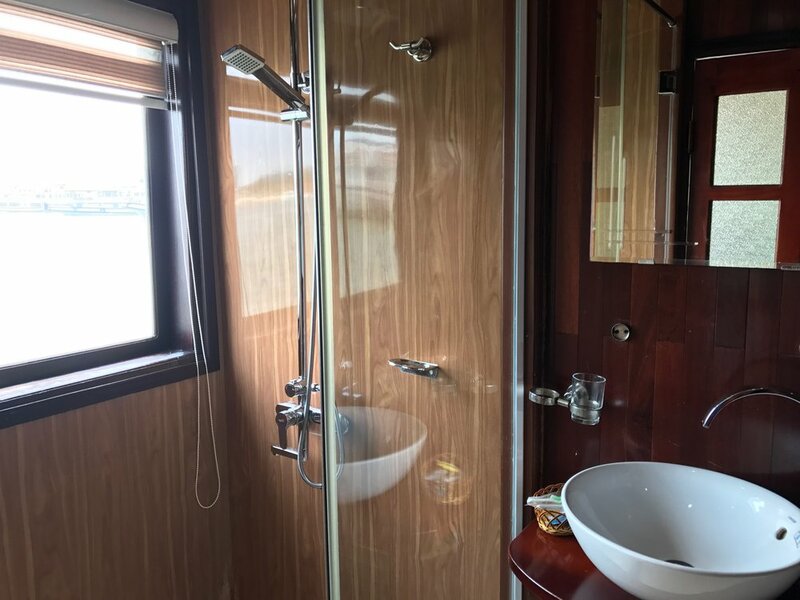 Our double rooms had a bathroom ensuite, stand up shower, consistent and available hot water, and comfortable window-side beds that allowed for us to witness the beauty of the Bay without leaving our rooms. I was pleasantly surprised by this and immediately felt more comfortable with my decision. Hungary, Australia, Spain, Lithuania, and America are some of the places that other travelers who were apart of the experience with us hailed from. Being on a boat for 32 hours with people from this many places throughout the world led to great conversation and memorable shared experiences. We kayaked through Ha Long Bay getting up close and personal with the raised mountains while watching the sunset along the horizon. We explored the inside of one of the caves, cruised along the waters at night to the majestically silent elegance of the Bay, and enjoyed a cloudy but memorable sunrise from the top of the deck. Staying overnight on a boat wasn't too shabby as well. Slept well, and crossed another item off of my bucket list. Vietnam overall had a wealth of things to offer. From the people, to the food, to the Bay you can definitely have a unique and unforgettable experience that doesn't cost vey much yet leaves you wanting more. Was certainly an honor to Pay it Forward in Vietnam.